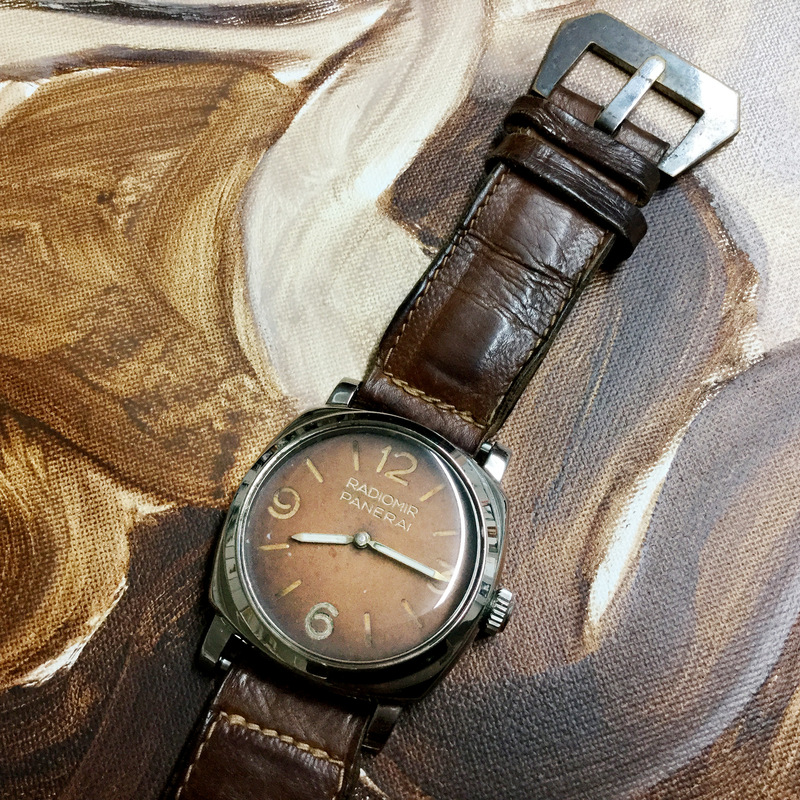 The following article about two vintage Panerai watches with exceptionally rare bluish tinted dials was written over a year ago. The extensive research conducted in this specific case revealed heavy inconsistencies and led me to believe that both dials were highly likely fake. Both watches form part of the same collection. I contacted the owner and presented the results of my research. He was not comfortable with publishing the article and I agreed to hold it back. In the months that followed, I was able to collect further evidence. For instance, a completely different watch with exactly one of those dials was auctioned by Antiquorum in 1998. Later in May 2017, I found “the smoking gun”, old photos of one of these watches – in its original, unaltered condition. This was a hell of a story but I was bound by my word not to publish the article. 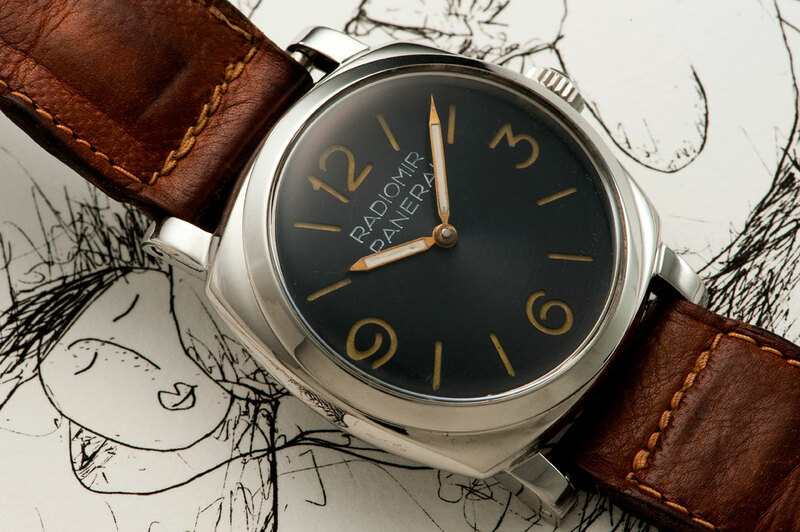 Richemont Officine Panerai released a series of watches featuring intense blue colour dials with sun-brushed finish. The inspiration for this decorative element came probably from two extraordinary rare historical Panerai watches which, due to their unusual deep blue dials with radial finish, clearly stand out in the world of vintage Panerai. The first vintage watch is a rare Ref. 6152 from 1953. 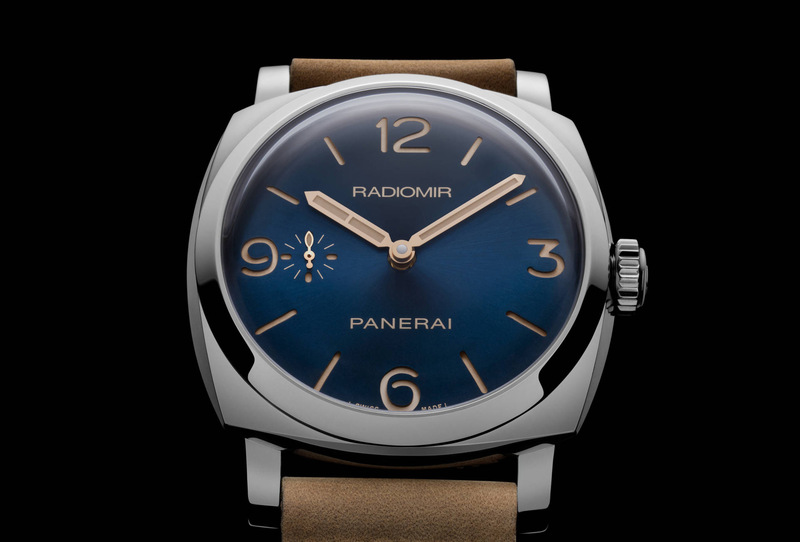 The dial of this watch bears the inscription “Radiomir Panerai”. The second watch is a modified Ref. 6152/1 with crown-protecting device from 1956 onwards. 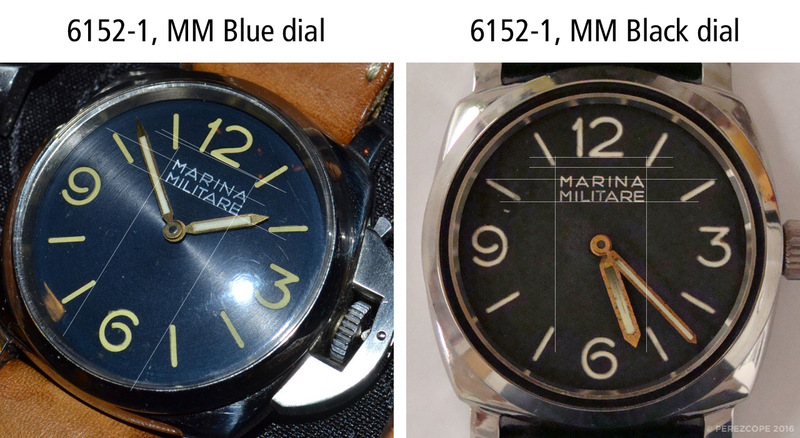 The dial of the latter has “Marina Militare” engravings. Both watches are featured in Ehlers & Wiegmann’s old and new edition of “The References”. 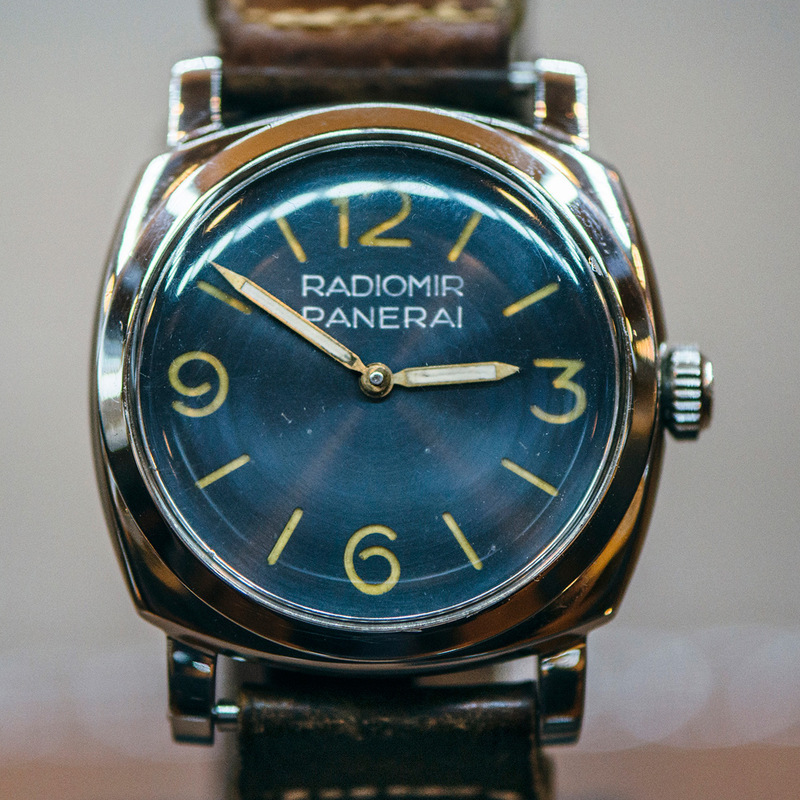 The first vintage Panerai watch featuring a blue “Radiomir Panerai” dial with radial finish is a rare Ref. 6152 with case number 956636. Ref. 6152 was produced in very small numbers in 1953. 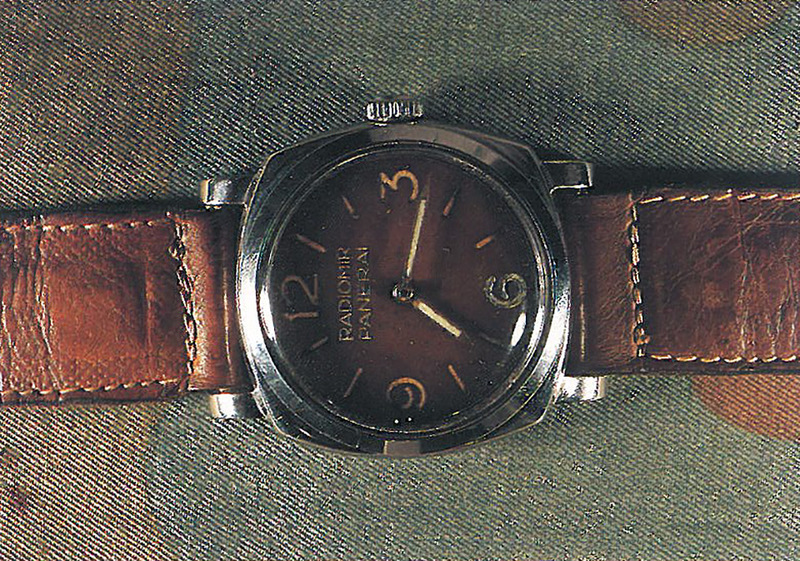 This model was Panerai’s first watch with lugs carved out of the same piece of steel as the case. 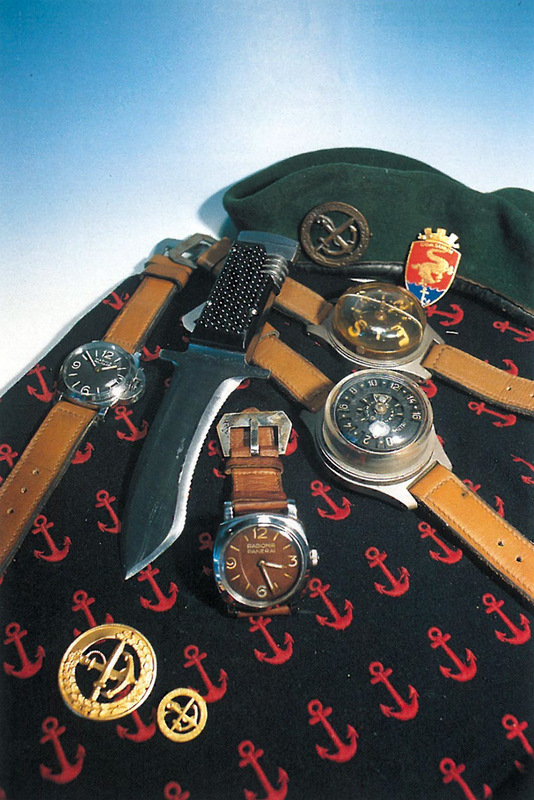 This watch was registered on the Italian Club Panerai website in July 2002. The owner was a Spanish collector. The caseback of this watch has very distinctive personal engravings. The name “E. 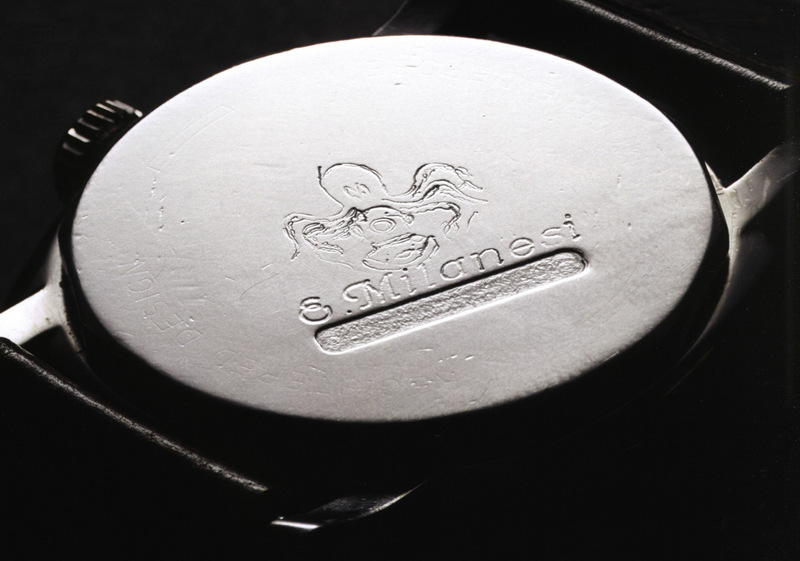 Milanesi” was professionaly engraved onto the caseback using letter stencils. I addition, a “Copper hat” diving helmet and an octopus were manually applied above the name. Underneath the name “E. Milanesi” there is an area that looks like an older inscription, maybe a military matriculation number, was removed. It is very unlikely that this was a common military matriculation number, as most known markings we know consist of two lines (SMZ M.M. 023) and are usually positioned in the center of the caseback. According to an old forum post, the Spanish collector checked the Italian naval archives in order to verify the existence of E. Milanesi. Mr. Milanesi was apparently a “Palombaro Sommozattore” (hardhat diver) during the 1950/60s. The need for such a research suggests that the watch did not come directly from Mr. Milanesi. If there is one watch that couldn’t be fake is this, it was purchased from the Sig Milanesi who was an italian diver and frogmen and has engraved on the backcase the Seal of his unit, his name and a date; Moreover I’ve checked with Fabio Castellani in the naval archives the authenticity of the “man”, and he was really a Navy’s Palombaro Sommozattore during 50’s/60’s. 956636 is equipped with a post-war Rolex 618 with 15 jewels. The movement ring has the typical three slots to accomodate so-called casing-up clamps, to fix the movement ring to the case. The second watch featuring a bluish tinted dial is a Ref. 6152/1, modified with crown-protecting device. The blue dial has “Marina Militare” engravings and bears the very same radial finish like Milanesi’s 6152. Only little is known about this watch. 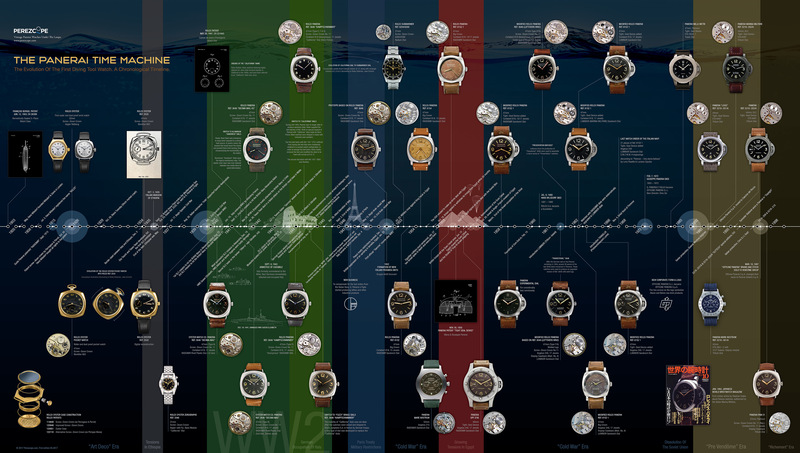 It appeared in the first edition of “Vintage Panerai – The References” in 2009. I found old photos which suggest that this watch belonged to the Spanish collector as well. The case number between the lugs was removed. This is nothing uncommon. Some of these watches were “extracted” from the headquarters of COMSUBIN and the case numbers were removed to hide their provenance. 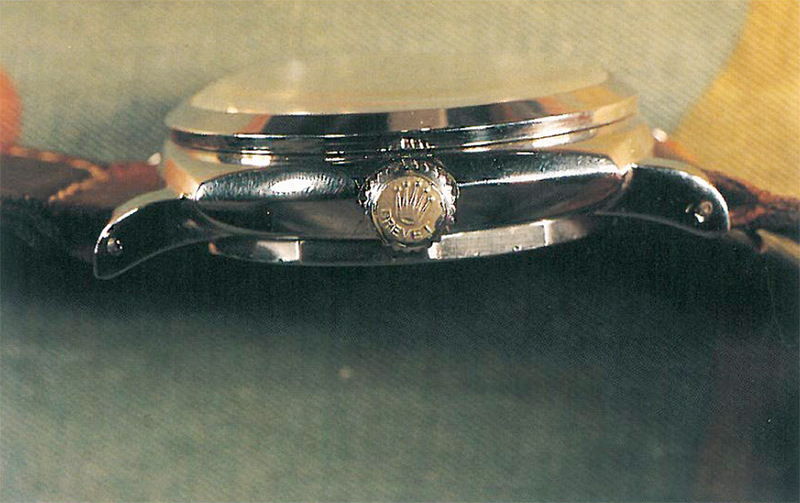 The Rolex 618 Type 4 with 17 Jewels installed in this watch is typical for Ref. 6152/1. Some of the differences between the blue dials and more common black dials are more obvious than others, the blue colour being of course the most obvious. Another difference is the radial brushed finish. 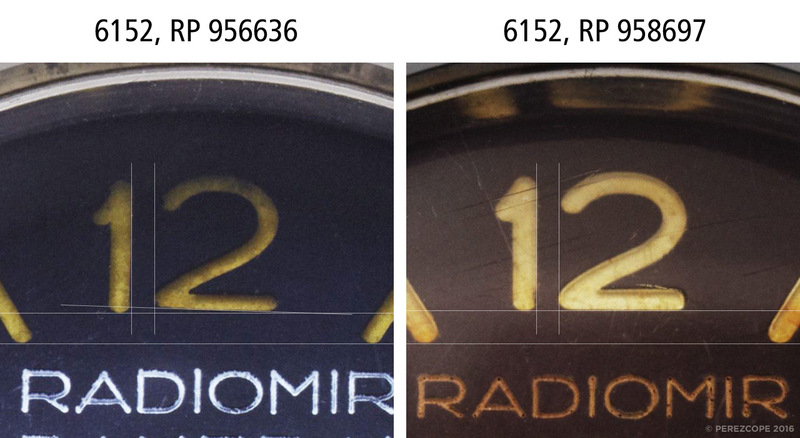 A closer look at the luminous material shows that both blue dials have yellowish numerals and markers, whereas the lume of more common “Radiomir Panerai” dials from the 1950s turned to sand tone colour. 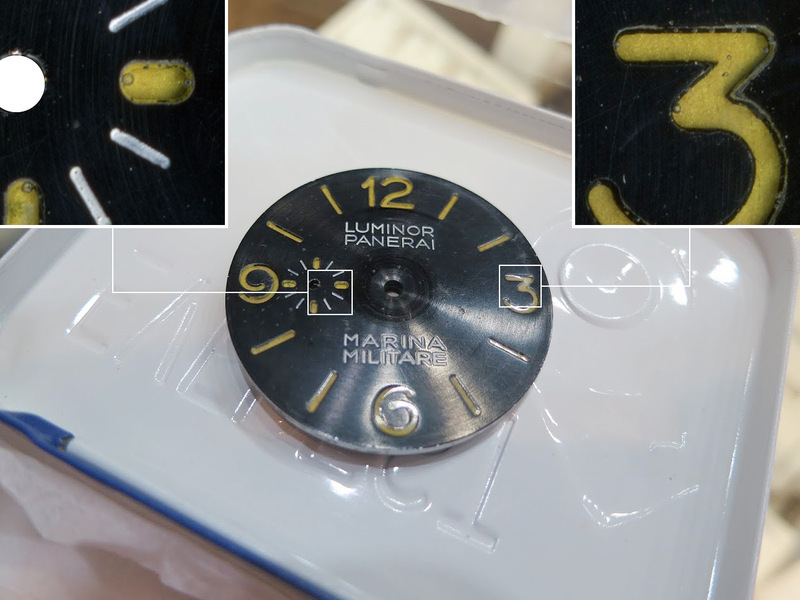 The luminous material of later “Marina Militare” and “Luminor Panerai” dials was tritium-based and remained almost white. Compared to the more common black G. Panerai e Figlio dials, the two bluish tinted dials also show some remarkable deviations in quality. G. Panerai e Figlio mastered the art of producing this type of dials in the 1940s and as a result, all black 1940s and 1950s dials are perfectly machined. On the blue Marina Militare dial, a closer look at the cut-out of the numerals at 3 reveals that the machining has not been executed with the same precision as seen on regular dials. A comparison between both bluish tinted dials shows that they share the very same issue with the numeral at 3. There is also an issue with the number 2 in the numeral at 12. The number 2 is noticeably crooked compared to regular dials. Both bluish tinted dials are affected by this issue. 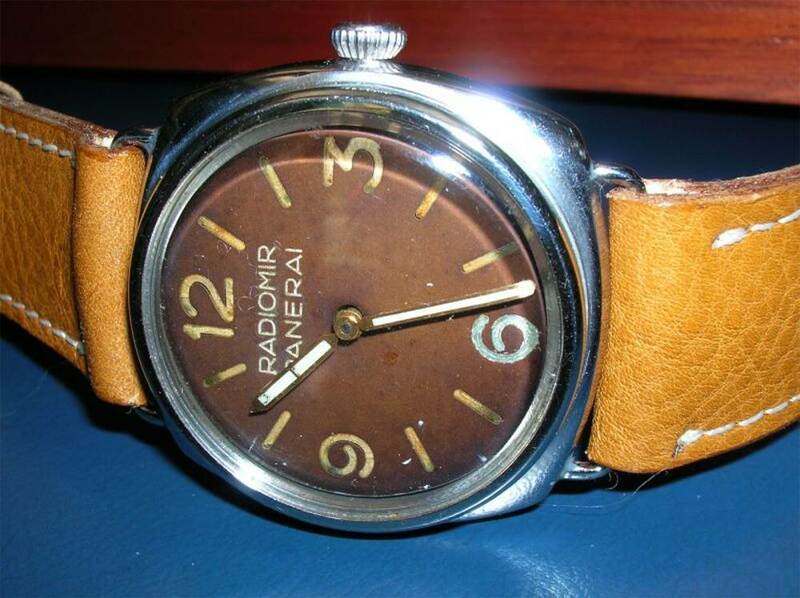 The following picture makes also clear that early “Radiomir Panerai” dials had bolder numerals and markers. The blue dial on the 6152 with case number 956636 has thinner cut-outs, similar to later “Marina Militare” and “Luminor Panerai” dials. There are several Ref. 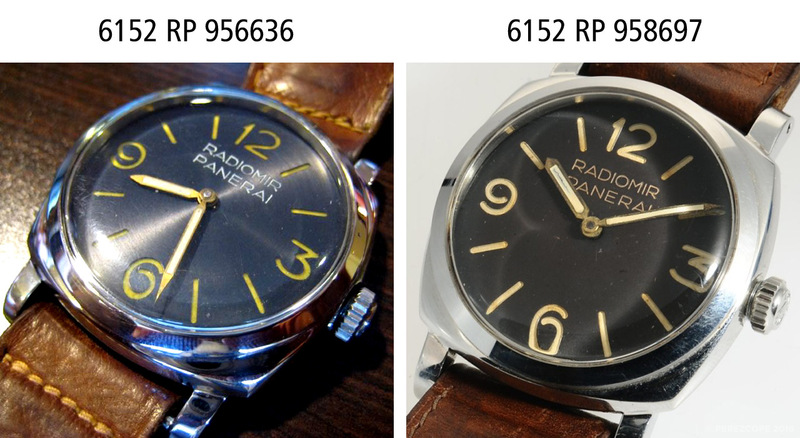 3646 watches featuring early 1950s “Radiomir Panerai” dials with bolder numerals and markers. After the revocation of the Paris Peace Treaty restrictions by end of 1952, the Marina Militare started to rebuild their frogman units. The instructors were mostly ex Decima MAS members and they probably brought their Panerai watches with them. 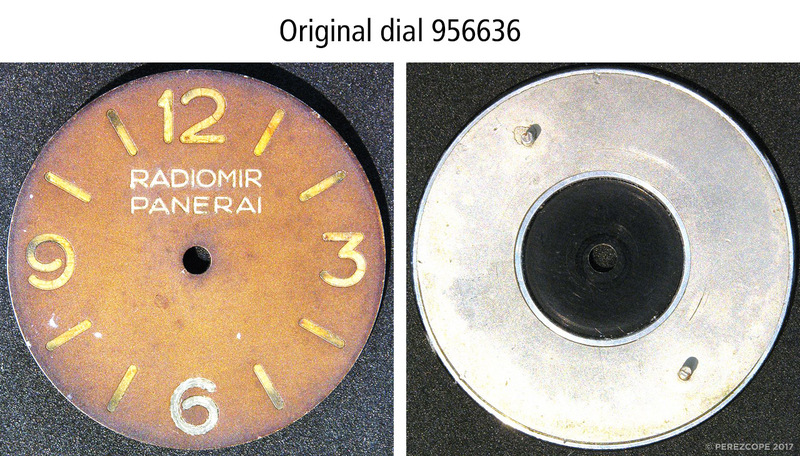 The glow on Radiomir dials had a lifespan of only 3 to 5 years. It’s more the probable that most 3646, which were still in service during the 1950s, were sent to Panerai for a dial update. 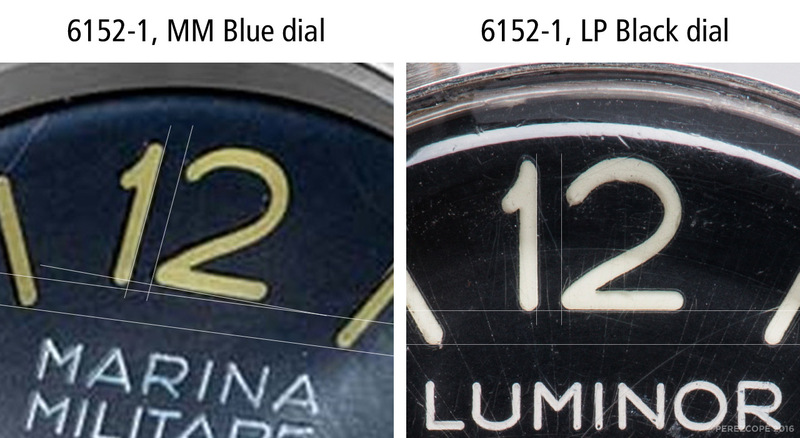 The next picture compares the bluish tinted dial from the 6152/1 with a regular “Luminor Panerai” dial. The number 2 on the blue dial is noticeably crooked as well. The style of the cut-outs is similar. Both blue dials have exactly the same basic issues. The cut-outs on G. Panerai e Figlio sandwich dials are filled with a clear substance to prevent the luminous substance from breaking off. There is a significant difference in construction between 1940s and 1950s dials. In post WW2 dials, the luminous compound is located directly underneath the perforated aluminium disc. A closer look at the numerals and markers of the “Radiomir Panerai” dial from the 6152 reveals tiny bubbles within the clear “filling”. None of the regular dials have this type of inclusions (bubbles). In 2013/14 a similar bluish tinted dial with radial brushed finish appeared on the market, but was ultimately rejected for being a suspected counterfeit. Detail pictures clearly showed bubbles within the numerals and markers. As you can see on the following comparison, the shape of the numeral at 3 was wrong too. Another important detail to look at are the engraved inscriptions. 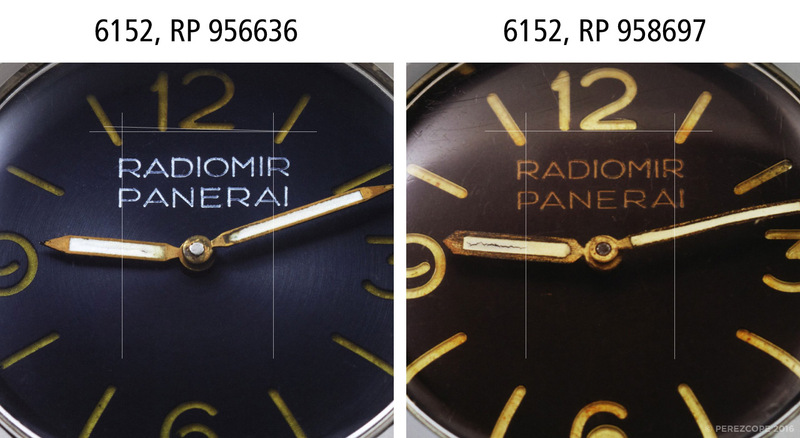 The dial in Milanesi’s 6152 has “Radiomir Panerai” engravings, which suggests that “Radiomir” was used as luminous compound. The 6152/1 dial bears the inscription “Marina Militare”. 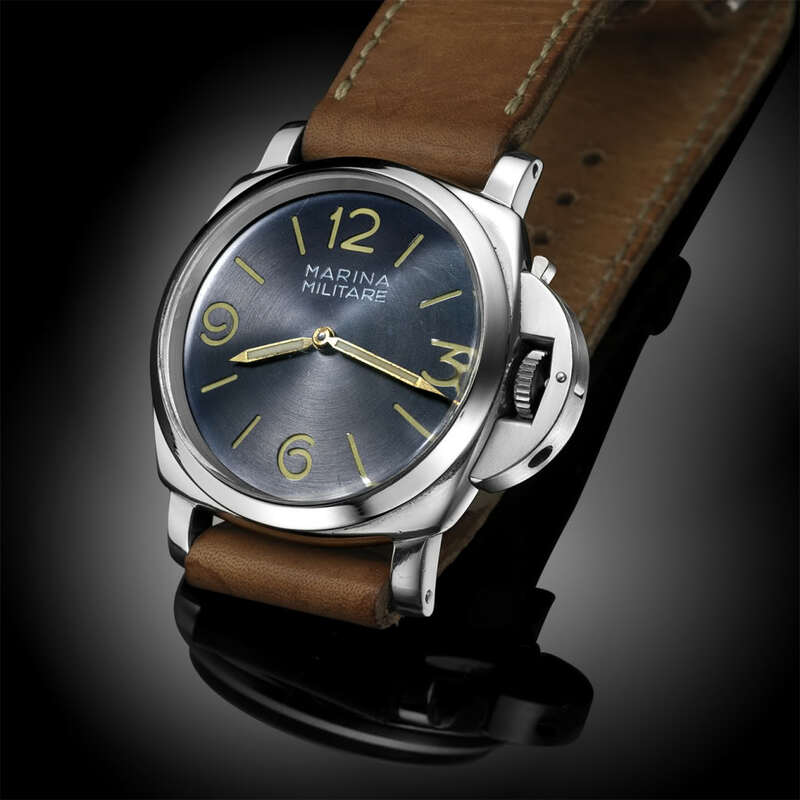 Marina Militare dials were made with “Luminor” lume, a compound based on harmless tritium. Despite different lume compounds, both dials have developed a very similar patina. However, the engravings on both blue dials are off compared to regular dials. 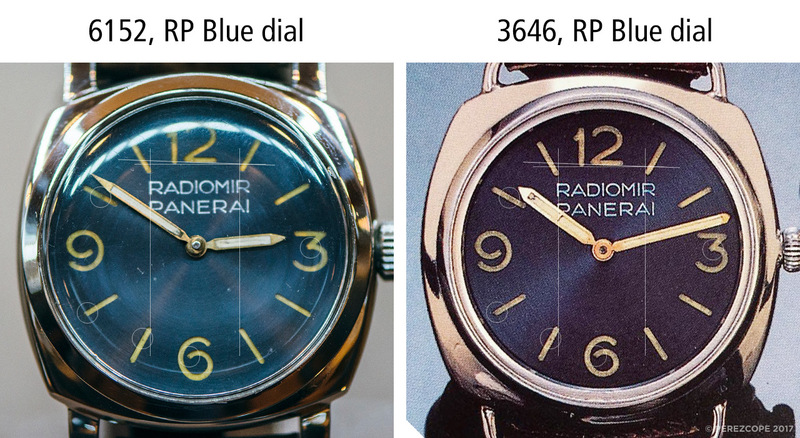 The following picture compares the blue 6152 dial with an early and more common “Radiomir Panerai” dial from the 1950s, which is installed in another 6152. The engravings on the blue dial are clearly off-center and too far to the right. 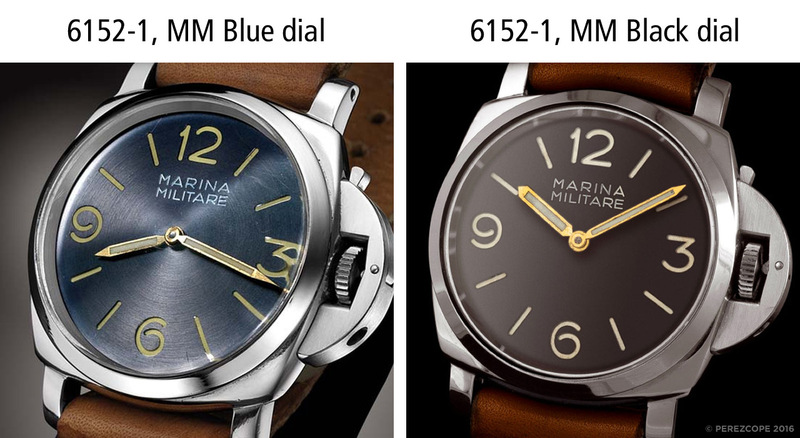 The next picture compares the “Marina Militare” engravings on the bluish tinted dial of the 6152/1 with a regular dial. The engravings are again off-center and too far to the right. On these dials we also make a remarkable re-encounter with an old friend, the “R” with the wrong shape. This “R” is a signature letter that has been spotted on several manipulated Kampfschwimmer dials in the past. 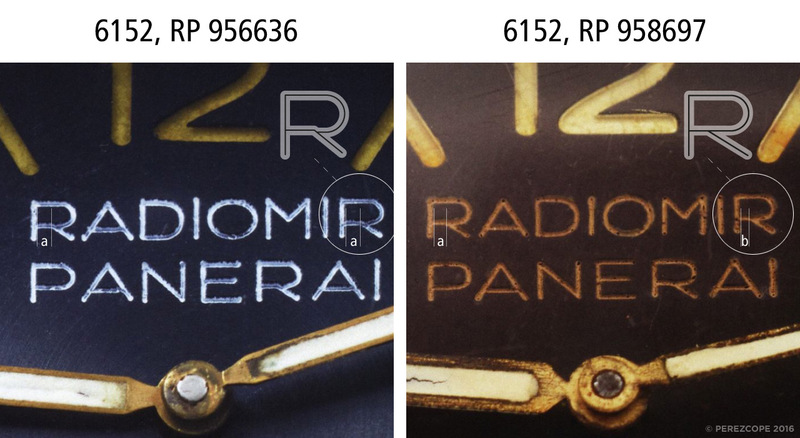 Another detail which does not match regular Radiomir dials is the last “R” of “Radiomir”. On regular dials from the 1940s and 1950s the last “R” is less wide and has a leg ( \ ) that is closer to the stem ( P ). The same applies to Luminor dials. It is highly unlikely that these engravigs were made by G. Panerai e Figlio. In early 2017, I came across a very interesting Antiquorum auction from June 1998. Lot 57, the Panerai Ref. 3646 in the center of the following picture, had a blue dial with Radiomir Panerai engravings. A comparison of this dial with the blue dial on Milanesi’s 6152 resulted in a perfect match. I had finally found clear evidence that the bluish tinted dial never belonged to Milanesi’s 6152 in the first place. In May 2017, I travelled to Florence to meet with Maria Teresa Panerai and attend the yearly Club Panerai Meeting in Viareggio. During a group visit of the Museo Tecnico Navale della Spezia, I overheard a conversation about Milanesi’s 6152. One can imagine how excited I was. 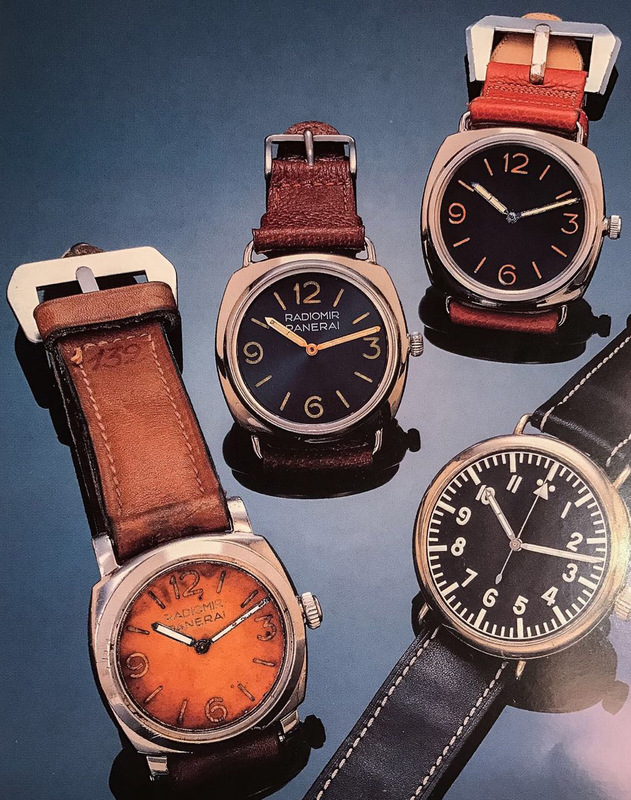 A gentleman mentioned that the watch had been published in an early 1990s article about Panerai watches and that the author of the article was a well-known Italian journalist. I managed to find the article the very same day. The watch shown on the main photo had a beautiful “tropical” dial. Another photo of the watch from the same article. The strap (incl. buckle) was never changed and is exactly the same as on the present watch. There was also a profile view of the watch in the article. It was without doubt a Ref. 6152. Unfortunatly, there was no photo of the caseback in that article. Later I got in touch with the author and during our very pleasant conversation, he told me that he had owned the watch for several years. An acquainted vintage watch dealer gave him the watch as a present in 1990. The 6152 had lost its original crystal and was equipped with a pocket watch crystal. Due to lack of original parts, the author ended up making a new crystal himself. I asked about the caseback and whether there were special markings. The author then described the engravings accurately from his memory. He also said, he never investigated who E. Milanesi was but it appered to him as if a military matriculation number had been removed. In 1998, he traded Milanesi’s 6152 for other items and never heard of it again. Finally, this was the smoking gun! After looking at the newly discovered photos for a while, I realised I had seen that dial before. The numeral at six looked like it had been repaired. I checked my database and found the dial in question. It was installed in a Ref. 3646. I won’t go into details but the hands on this watch are the same as on the 3646 from June 1998. So I started to ask around to see if someone knew where this particular watch was. Then, to my total surprise, the dial surfaced on its own, and was available! I contacted the owner of Milanesi’s 6152 and told him the good news. He straight away seized the opportunity. He flew to Italy with the watch and had the dial replaced. On his way back, he was detained by the JFK airport security for carrying radioactive items. They released him and the watch after one and a half hours. And here it is: Milanesi’s 6152, 956636. Restored to its original condition from 1990. Probably the most beautiful 6152 out there. After 17 years, the odyssey of this watch has finally come to an end. This was without a doubt the most exciting research I have ever conducted. Bluish tinted Panerai dials were always a bit fishy in my eyes. Why would a supplier of military instruments care for adornments like radial finish or blue colour? This never really fit into the picture. What satisfies me most about this particular case is the positive outcome. After so many years it was possible to bring a manipulated watch back to its original condition. The original dial in Milanesi’s 6152 was probably replaced due to its “damaged” numeral at six. The seller probably thought, the watch would sell better with a “newer” dial. To me, the repaired 6 is less a damage and more a feature. It makes this watch absolutely unique. It is unknown whether the person who replaced the dial knew the blue dial was fake. 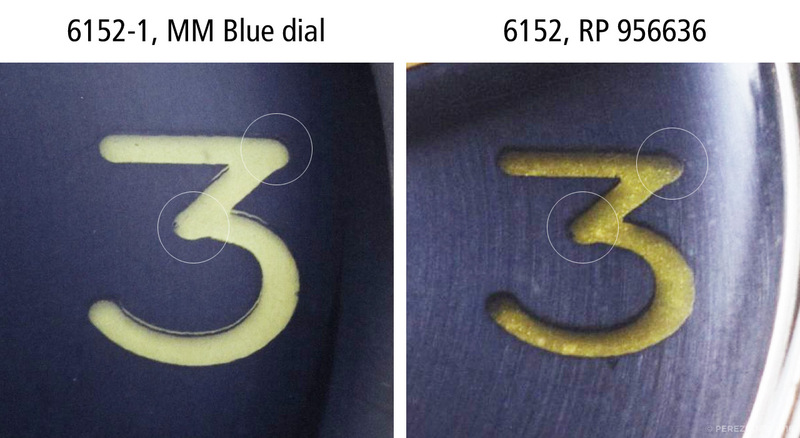 Latest forensic investigations indicate that fake dials with bluish tint, as well as many manipulated “Kampfschwimmer” dials, originate from the very same source: Luciano Rinaldi, a well-known counterfeiter of Rolex and Panerai watches. Milanesi’s 6152 and the 6152/1 with bluish tinted dial ended up with the aforementioned Spanish collector in the early 2000s and remained in his collection until 2009. In 2009, both watches were featured in Ehlers & Wiegmann’s first edition of “The References” and were subsequently sold to the current owner, together with another very questionable watch that had been published in that book. The current owner must have felt very safe with the deal, considering all three watches were published in a book, and thus “legitimised”. Ref. 6152 and Ref. 6152/1 are milestones in Panerai’s amazing history. Please click the following graphic to open the highres version.